I call these pockets because they come out looking more like a pocket than roll – for me anyway. It’s a simple, fast recipe that can be served as a side for the family or kept in the fridge to use as a main course for several lunches or dinners. They’re one of my favorite go-to recipes when on a deadline because I can make one batch and for the next few days my lunch is a quick zap in the microwave. Remove the shells from the shrimp. If you’re using salad shrimp then just rinse and hold in reserve. If you’re using larger shrimp, cut each one into thirds and hold. Then heat 1 tablespoon coconut oil in a large frying pan. Rinse brocco-slaw and pat dry, then add to the pan. Allow the brocco-slaw to cook for a minute and then add the shrimp, salt, pepper and any other seasonings that you’d like. Cook until shrimp are pink but don’t over cook because we’ll be putting these buggers in the oven too. Remove from heat. Lightly butter or spray the bottom of a cookie sheet. On a dry surface, lay out an egg roll wrap. Using a slotted spoon to remove excess liquid, take a spoonful of the shrimp & brocco-slaw mix and put it in the wrap. Roll or pocket it. As in, make it into a pocket-like-thing not put it in your pocket. That’d be messy. Place finished pocket on the cookie sheet. Repeat until all the stuffing and/or wraps are used. Melt butter or use oil of your choice. Brush the butter or oil over the tops and sides of the pockets. Place in oven and bake for 10-12 minutes – until they’re browned. Allow to cool a bit and eat with your favorite sauce. If there is extra stuffing, chill it and use it to top salads later. 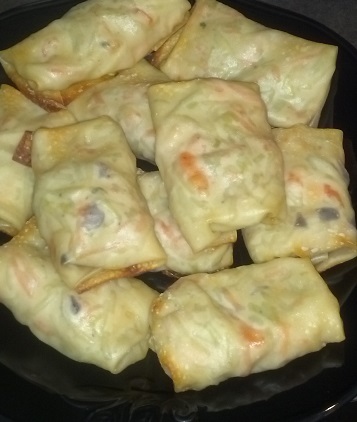 If there’s extra wraps, place miscellaneous veggies and/or cooked meats in them – whatever you have on hand – roll and cook them with the shrimp pockets. With Thanksgiving coming, this would be an interesting way to use some of the leftovers.